There’s nothing quite like standing on a forest trail and suddenly realizing a bear is 20 feet away and watching you. 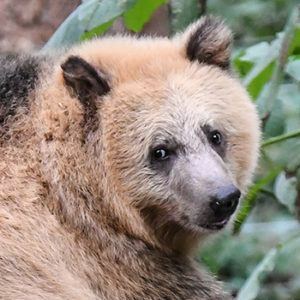 At Northwest Trek you can experience that feeling from the safety of our bear bridge and trails, watching our black bears forage and build their den. Thrills, yes. Danger, no. And that’s a beary good thing. WHAT: Large, strong animals with a wide range of coat colors from brown to bright blonde, smoky blue and even white. WHERE: Forests, swamps and mountains across the U.S. and Canada into Mexico. SIZE: Length 4-6.5 ft.; height 2.3-3.5 ft.; weight 130-500 lbs. (males), 90-350 lbs. (females). EATS: Omnivorous. Primarily plants, sometimes carrion or animals. BABIES: Breeding from May-July. After a 6.5-8.5-month pregnancy, sows give birth to 1-4 hairless cubs weighing about half a pound. FUN FACTS: In harsher climates, black bear will den up in hollow snags and burrows for winter. They can emerge if the weather warms up or if they are disturbed. 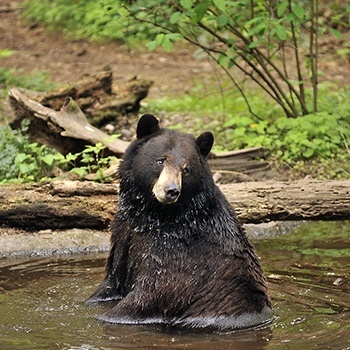 A black bear’s territory can cover up to 100 miles. When not sleeping, they spend most of their time foraging for food. They are also good tree climbers. One of the largest terrestrial predators in North America, with blond, brown or black fur, long curved front claws, a prominent shoulder hump made of muscle. We have two newly-arrived grizzly cubs, orphaned in the wild. How do you give two grizzly bear cubs their first physicals? With intense preparation, timing and care.